Now that you're armed with the knowledge of the eight types of product and niche opportunities from the last chapter, it’s time to start looking for some product ideas. Coming up with a great idea for a product to sell online will occasionally strike when you least expect it, most of the time though, it's something you need to be proactively on the lookout for. The internet contains a wealth of ideas and inspiration, but where exactly should you begin? In this chapter we will look at the best places to go for product inspiration and ideas. As you go through all the resources listed in this post, make sure to look beyond the products themselves. It may sound cliché but because there is heavy competition in the most common and popular product categories, choosing a different or unique angle can be instrumental to your success. Try not to just look at products, rather look at new ways the product can be used, new ways it can be imagined and new markets for it. As you go through this chapter and the list of resources, it's best to capture all of your ideas on paper. Once you have all of your brainstormed ideas recorded, you will be able to return to them later and evaluate them further for viability and market potential. Before you begin searching the depths of the internet and the ends of the earth for product and niche ideas, it's always best to start with the ideas that you already have. If you're like most entrepreneurs, you likely already have a few ideas for products you want to sell or have thought about selling in the past. Maybe it's an idea you've had for years or maybe you have a problem in your own life that there is no good solution for currently. What products, niches or industries are you particularly passionate about or interested in? What pain points or frustrating experience do you have in your own life? Example: Max Valverde made the decision to solve one of his own problems he faced each morning; unruly, messy hair. For most guys, bed head can only be fixed by washing your hair, but this takes a lot of time each morning so Max created a product to solve this. Morning Head is a shower cap with an absorbent towel liner that you can soak with water, place on your head and rub around for a minute to get your hair ready for styling. The idea for your perfect product to sell online might be closer than you think. Traditional brick-and-mortar businesses have been around much longer than their ecommerce counterparts. Paying attention to trends locally in brick-and-mortar retail just might help spark product ideas you can take online. Try spending an afternoon taking a look around your community and note what new or interesting retail concepts and products are on display. Another great source of product inspiration within your community can come from your local newspapers which tend to feature new, innovative and local concepts and products. As you look at these resources, ask yourself if they can be turned into an online opportunity. Example: Yummy Tummy Soup Company saw an opportunity to take a traditional brick and mortar concept and make it an online concept. The Yummy Tummy Soup Company sends out healthy homemade soups, cakes and pastries in a thoughtful care package. They cook and bake all products daily and send them coast to coast in temperature controlled containers. What better place to find a interesting products to sell online than from publications who's job it is to curate new, interesting and trending product ideas. Following trend publications is great way to begin getting a sense of the direction consumer products are going and the ideas other entrepreneurs are introducing to the market. Following these publications can also expose you to new product categories and industries that you previously didn't know about. Trend Watching - Trend Watching is an independent trend firm that scans the globe for the most promising consumer trends and insights. Trend Watching has a team of thirty professionals in locations like London, New York, Singapore, Sydney and Lagos all looking for and reporting on worldwide trends. Trend Hunter - Trend Hunter is the world's largest, most popular trend community. Fuelled by a global network of 137,000 members and 3,000,000 fans, Trend Hunter is a source of inspiration for aspiring entrepreneurs on the hunt for new product ideas. Jeremy, the founder of Trend Hunter says, "Like many of us, I was an entrepreneur at heart, but I didn't know what idea I wanted to pursue. I chose careers that I thought would lead me to my business idea... but after years of searching, I was still hunting for inspiration. It was then that I started Trend Hunter - a place for insatiably curious people to share ideas and get inspired." Springwise - There are millions of business ideas spanning the globe that operate in a specific way, have their own style, and market in a unique fashion. It’s not always possible to travel the world searching for these ideas to bring home though. That’s where Springwise comes in. Springwise travels the world for you, on the search for new entrepreneurial ideas, trends, and stories. Springwise publishes a daily and a weekly newsletter, which you can subscribe to for free. Example: Dan, the founder of Inkkas shoes is a great example of someone that took a trend from another country and brought it to North America. Inkkas are beautiful, unique shoes designed using authentic South American textiles. The idea came about when Dan noticed the trend for this style of shoes in Peru. After deciding that this was a great product that would also do well in the North American market, he brought the idea home and successful funded a Kickstarter project, raising over $77,000 in pre-orders for his shoes. You may not know what product to sell, but maybe you know the industry or market you would like to be in. Using various online tools, you can discover and follow the influencers in the industry you're interested in. Following the right people on social media can help uncover and inspire new ideas from a constant stream of carefully curated content from the people that are in the know. Product review and discovery sites can also be a fantastic source of ideas and inspiration. 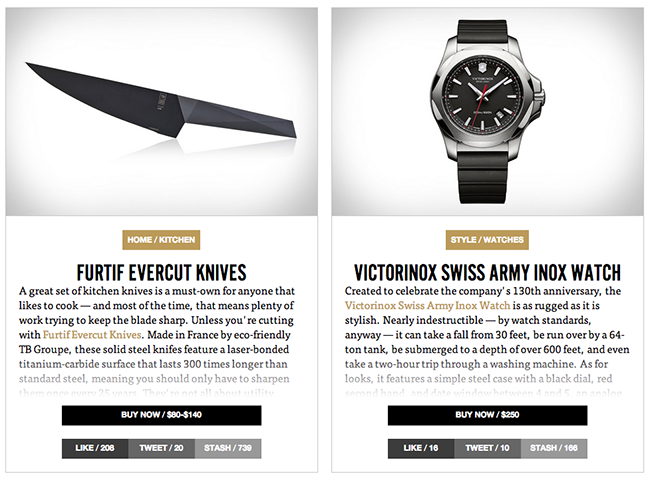 Sites like Uncrate (men’s products) and Outblush (women’s products) are great ways to see new curated product trends daily. What better way to get inspired than to get a daily glimpse into the new and interesting products other entrepreneurs are bringing to the market. Don't limit yourself to just looking at the big and popular product blogs but explore niche reviews sites as well. Consider what types of products and niches you're particularly interested in and follow product review blogs in those niches. Social curation sites like Pinterest can be a goldmine for product and niche ideas. Many of the images contain interesting, new and trending consumer products. Using the built in social signals you can sometimes get a sense almost immediately of their popularity. This could be your first clue if there is a market for the product. Pinterest - Pinterest is one of the fastest growing social network with over 50 million monthly users. Make sure to check out the popular section for what's currently trending. Polyvore - Polyvore is another great service, similar to Pinterest. Polyvore's global community has created over 80 million collage-like “sets” that are shared across the web. Fancy - Fancy describes themselves as part store, magazine and wish list. Regardless of what it is, it's filled with product ideas for you to explore. Wanelo - Wanelo (Want - Need - Love) describes itself as a community for all of the worlds shopping, bringing together products and stores in a Pinterest like product posting format. You can start by checkout out trending people. What better way to get product ideas than right from the source. This has been a popular option amongst ecommerce entrepreneurs for a while and this list wouldn't be complete without it. Wholesale and manufacturer sourcing sites like Alibaba exposes you to thousands of potential product ideas. It can be easy to get overwhelmed with the sheer amount of product available so take your time. Alibaba - You’ve likely heard of Alibaba. They are the biggest ecommerce company in the world, even larger than Amazon and eBay combined. Alibaba connects consumers all over the world with wholesalers and manufacturers (typically) from Asia. With hundreds of thousands of products, there's not much you can't find on Alibaba. Although it's generally accepted that Alibaba is the largest online wholesale and manufacturer database, there are many other sites similar to Alibaba you can use for inspiration and to find product ideas. eBay - eBay is the largest online consumer auction site. 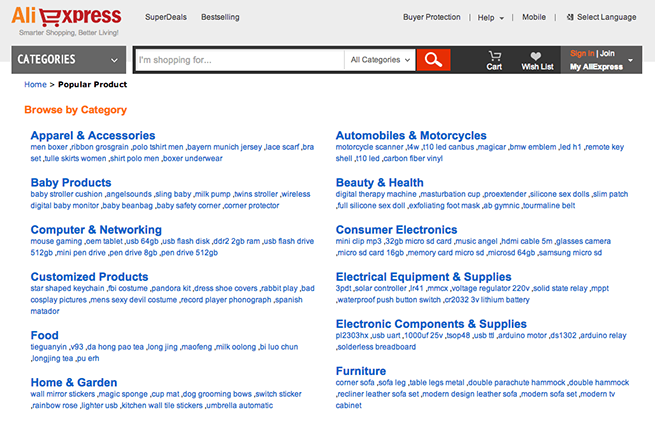 eBay Popular - A list of some of the most popular product categories on eBay. eBay Watch Count - An online tool that will list the most popular items on eBay based on how many people are "watching" them. Amazon - Amazon is the largest internet retailer. Amazon Bestsellers - Amazon's most popular products based on sales. Updated hourly. Amazon Movers and Shakers - Amazon's biggest gainers in sales rank over the past 24 hours. Updated hourly. Kickstarter - Kickstarter is the largest crowd-funding website. Kickstarter Discover - Browse all projects by popularity, funding, staff picks, as well as many other options. Etsy - Etsy is a marketplace for handmade items. Etsy Trending Items - Check out the current trending items and listings on Etsy. AliExpress - AliExpress is a new consumer wholesale marketplace from Alibaba that allows you to order in small quantities. AliExpress Popular - The most popular products being bought on AliExpress. Reddit is the largest social media news aggregator. It describes itself as the front page of the internet and is enormously influential. Reddit has thousands of “subreddits” which are sub-sections or niches that cater to different topics and and areas of interest. It’s within these subreddits that you can find lots of inspiration for product ideas. Buy It For Life - For practical, durable and quality made products that are built to last. Shut Up And Take My Money - Interesting, clever, useful products that that people want… badly. No matter which approach you take, Reddit is has been and continues to be a rich and valuable source of entrepreneurial ideas and inspiration, coupled with a supportive community. Instagram isn't just pictures of food and puppies, it's also a great option for discovering new product ideas. Because it's photo based, it makes it easy to scan through many ideas and photos quickly. Hashtags - Once again, if you have a particular interest in a product category or industry, you can try searching for applicable hashtags and following relevant people in the market/niche or industry. Another great option is to do a search on Instagram for applicable hashtags that insinuate buyer interest and intent like #want and #buy. Product Curation Accounts - There are many accounts on Instagram that post curated product content. Like many other examples above, you'll likely want to search for and find accounts within the niches you are particularly interested in. As an example, Shopify curates interesting and unique products from Shopify’s 90,000+ online stores. It might just provide the idea or spark for your next product. With all these resources you should be able to start generating a pretty healthy list of initial products ideas to begin exploring further. In the next chapter, we're going to look through all of the resources ourselves and share some interesting product ideas with you.